With the help of hundreds of volunteers and support staff, approximately 4,500 first-year students spend their first day at the university. 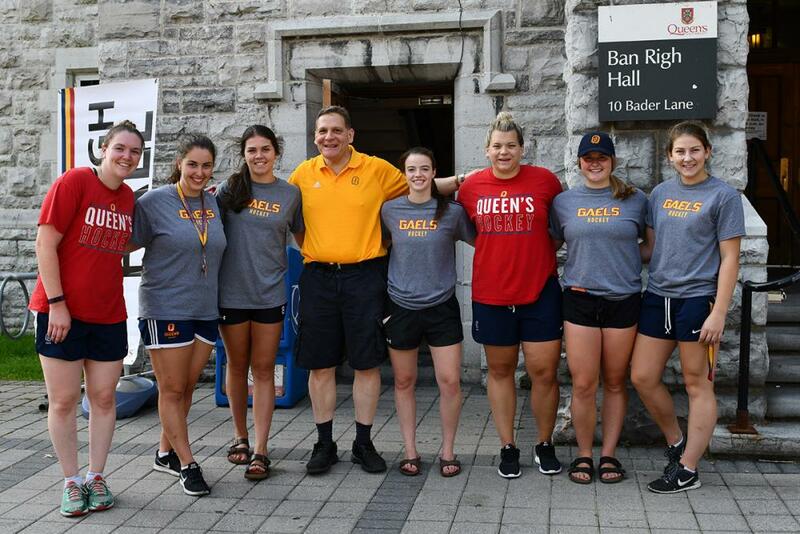 Principal Daniel Woolf met up with members of the Gaels women’s hockey team who were volunteering to help first-year students on Move-In Day. It was a busy day, but with the help of volunteers and support staff, the 4,500 students of the Class of 2022 moved into the residences at Queen's University. Principal Woolf met up with Megan Rook and Jessica Anderson, and their families, as they moved into the same residence room that the principal had when he first arrived at Queen’s as an undergraduate in 1976. Vice-Provost and Dean of Student Affairs Ann Tierney welcomes first-year students to Queen's University on Saturday, Sept. 1. After moving into their residences, the Class of 2022 attended one of two Queen's Welcomes U events on Saturday night. Principal Daniel Woolf speaks to the Class of 2022 during the Queen's Welcomes U at the main gym of the Athletics and Recreation Centre. Students in the Class of 2022 listen as Principal Daniel Woolf welcomes them to Queen's during Saturday night's event at the main gym of the ARC. AMS President Miguel Martinez and Rector Alex Da Silva talk about their roles at Queen's during the Queen's Welcomes U event. It was a busy day as more than 4,500 first-year students moved into Queen’s University Residences on Saturday, Sept. 1. Students were assisted by hundreds of volunteers and support staff. A head of Move-In Day a carefully coordinated plan was created by a working group of representatives from the university, the City of Kingston, and Kingston Police. Move-In Day was moved to Saturday for the first time to help accommodate the introduction of a new Fall Term Break for students. A number of activities, including a welcome by administration members on Saturday evening and Gaels football home opener on Sunday night, helped the new arrivals settle in to their new homes. Faculty orientation started on Monday and will continue through Wednesday. Classes start on Thursday, Sept. 6, and orientation activities will continue with faculty events on Sept. 8, and campus events on Sunday, Sept. 9. For further information about orientation activities, visit the university’s Orientation website.